The repercussions of a failed military coup in Turkey are unfolding faster than the details of the treasonous act itself. Late on Friday July 15, a small faction of the Turkish military drove tanks into the nation’s capital city Ankara and Istanbul, blockading the Bosphorus Bridge which connects the European and Asian sides of Istanbul. Other locations affected by the coup include CNN Turk, where a reporter was forced to go off air by the military, and Parliament, which suffered damage to its buildings. These events transpired during President Recep Tayyip Erdogan’s vacation in Marmais. After the military demanded media outlets go off air and breached social media platforms (common in Turkey during times of protest), Erdogan addressed his citizens via FaceTime and urged them to take to the streets and stand in defense of the government and against the uprising. People who accepted his mission were met with unprecedented violence as gunshots sounded near the presidential palace. The coup resulted in 290 deaths, and 1,400 injured after it’s end was announced by the Turkish National Intelligence about three hours after its commencement. Despite the 7,000 arrested following the uprising and the 13,000 public officials who, upon investigation, were either removed from office or suspended, Erdogan’s reassertion of power has come up short in identifying the coup’s mastermind. The President seems certain that his enemy, Fethullah Gulen, a 75 year old man who relocated from Turkey to Pennsylvania in 1999, is responsible for the attempt to overturn his government. Gulen has denied the accusation, and 27 men have been accused of plotting the uprising- many of whom are military personnel. Without first determining who is responsible for the coup, motive is difficult to establish, but Turkey’s history of a 10 year cycle of coups is undeniable. 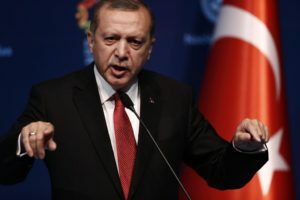 The rest of the world watches on with concern as Erdogan seizes this opportunity to reestablish his power; he is known for authoritative behavior and is undoubtedly exercising his power in light of the failed coup. The U.S. has expressed its disapproval of such authoritative behavior, and Amnesty International warns of the effects of Turkey’s past coups on human rights, especially regarding the potential introduction of the death penalty. Crowds addressed by the president after the coup demanded the death penalty for those guilty of treason. Erdogan acknowledged the people’s democratic right to seek legislative change regarding the death penalty, but is cautioned by the EU Foreign Policy Chief, Federica Mogherini, who made it clear that no country who introduces the death penalty may enter the European Union. Given Turkey’s current dependence on its NATO membership and its international allies in foreign policy, the possibility of being excluded from the EU would be detrimental for the nation’s foreign relations. Western countries also fear that the division between Turkey and its allies will lead to increased instability in the country and a weakened defense against ISIS. After the uprising’s challenge of the legitimacy of the political administration, the President’s actions following the coup are crucial in defining Turkey’s internal and foreign relations. The rest of the world can only watch and hope that while he stands before Turkey to demonstrate his administration’s power, that he not stand with his back turned on his foreign allies.